Oktoberfest arrives this week. But if you're flying with Lufthansa around the fest, the party can get extended (or start early depending on your plans). The airline has announced it will bring Oktoberfest into the skies this year. 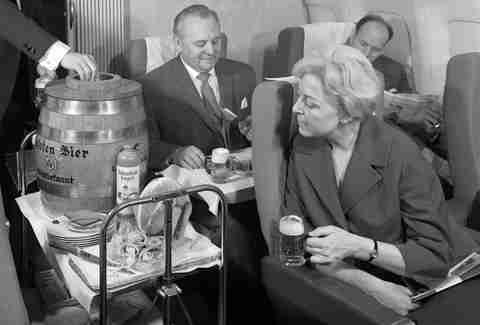 For the first time in 50 years, Lufthansa will have kegs filled with beer onboard flights from Munich to New York/Newark (September 19), Singapore (September 25), and Shanghai (October 6) to server passengers draft beer thousands of feet in the air. The airline used to serve on "Lufthansa Senator Service" in the 1960s, as seen in the picture below, but long ago discontinued the service. The cabin crew will toss out the navy and yellow uniforms for the occasion. Instead, they'll don traditional Bavarian outfits in blue and gray. The custom dirndls and lederhosen were designed for Lufthansa by the Munich-based Angermaier. The aerial Oktoberfest doesn't stop at the kegs, however. Business class passengers on all flights during Oktoberfest will be served from a themed menu, which includes ox tartare with truffle, Arctic char with Riesling sauce, and pistachio pesto. It will also have an Oktoberfest menu in airport lounges.